In this art installation in Brazil, 2 brothers are living outside of their apartment in the name of art. The building is in Rio’s Old Center. 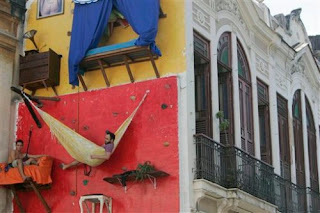 Tiago and Gabriel have been sleeping, working and eating on the side of a building 33 feet above the ground for 12 hours a day. This began in May and will end in August.